When it comes to enjoying a long day at the beach, having a stylish and comfortable beach chair is imperative to having a great time. But because there are so many choices out there, it can be difficult to choose the best one. This is where Scubaotter comes in, as we have tried and test every option below allowing you to make the best decision for you. This chair is #1 on this list and for good reason. 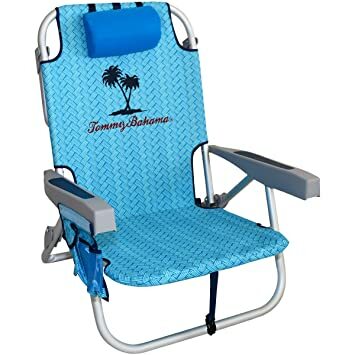 Made from polyester with a thick head pillow (2 inches), this chair is amazing for all beachgoers. The head pillow is nice as it allows opening for the face cavity. The chair and frame are able to support 250 pounds or so which should accomodate most people. There is a swing out holder to hold beverages, phones, bananas, you name it. It also has 2 adjustable pillows for extra comfort. The char is only 11lbs making it easy for most people to carry. In terms of appearance, the chair is pretty basic but this isn’t neccesarily a con. The chair is relatively low to the ground (around 13 inches), which could be an issue for some people. Also, the chair has backstrap so that it can easily be carried on someones back freeing up the hands. Overall, this chair gets the job done. The Sport-Brella Beach chair is perfect for those beaching in extremely hot/sunny locations. The umbrella attachment covers 360 degrees of sun and is extremely aerodynamic which makes it perfect for dealing with annoying wind. The chair also comes with a cute carrying back for easy portability. Just like the previous chair, this one is a bit lower to the ground which can be annoying for some people. While it may be hard to see in the picture, this chair has a very vibrant color and is great on the eyes. One con for this chair is that there is no pocket for storing phones or other electronic devices. We know this may be hard do without for some of you. Lastly, there are some people who complain the chair is hard to back up once you’re done for the day. This chair is one of my favorites on this list and for good reason. The well-built aluminum frame adjusts to 5 positions allowing you to hit the right level of reclinement. Just like some other chairs, this guy comes with backpack straps allowing for easy transportation. The chair claims to hold up to 240 pounds with no issue which should get the job done. In my opinion, this chair is the most stylish by far. The chair also comes up with a mesh back for carrying as well as a pouch for the storing of electronic devices and other items. What’s amazing about this chair is the cooler and compartments. On the seat back is a section with a cooler for cold storage, and a pouch for dry storage. This allows you to bring so many different things to your beach trip. One thing I noticed when using this chair is how well is reacted to my body shape. Because of the materials used to contstruct this beauty, it’s extremely light weight and can be carried by kids! What’s not to like about this chair? Made from 600D Polyester, this lightweight alumunium frame allows the sitter to recline to 5 positions with their beverage of choice by their side. In addition, the chair comes with a cell phone holder (everyone has a cell phone at the beach nowadays), and a folding tower bar. These chairs can be somewhat difficult to close, so below is a quick video demonstrating how to do it. If we take a look at any comparison of beach chairs, you will surely see a wide range of models or styles compared to the usual products. To these traditional chairs, foldable on themselves, have been added others such as beach-style bedchairs, as well as products with different heights and all kinds of advantages, so you have maximum comfort for longer. Among the traditional chair models, the novelty lies in finding models of different heights, ranging from the classic or conventional chair, the best and economical if you want to stay seated and has a seat about 40 cm high, approximately the lowest models around the 20. The offer is wide, so you will have no problem finding a product adjusted to your own height. Regarding the designs, to the conventional chair are added others such as beach chairs, which have a reclining system that can even leave the backrest completely flat to give you more comfort. And as a last novelty, we find the folding chairs in umbrella format, which are much more comfortable to wear when folded in a space similar to that of a small beach umbrella. By the way, thanks to the wide offer nowadays there is not much difference in how much one model or another costs. Another important aspect when buying a beach chair is the materials used to manufacture the product. Although times and models have changed, beach chairs still maintain the same old materials, although improved to have greater resistance to water, salt and other threats to which they are usually exposed. If we talk about the frame of the chair, the usual is that it has been made of high quality aluminum, which increasingly offers greater strength and a slightly lighter weight. This material must be properly protected, by using paint, to avoid as we have said that the metal deteriorates. In this section do not forget to take a look also at the areas of union of the product, where it opens, which must be resistant to avoid disappointment. Regarding the material with which the backrest and chair is manufactured, the most usual one is still plastic mesh. This mesh offers good breathability and high resistance, so that they have a good load capacity when sitting. Some models are presented in fabric with metal inserts, which are a good alternative, although they are not as cheap as mesh. Finally, other models are simple cloth and properly subject, but without inserts. In any case, the backrest should always be comfortable, pleasant to the touch and resistant to the load that it will support. As a last aspect related to these chairs, it is necessary to talk about the measures. Some measures that have to go hand in hand with your own height, since the higher you are, the more likely it is for you to look for a chair with a higher backrest height. Given that the offer is wide, it is advisable to bet on models at least 60 cm wide, at least 80 or 90 cm in height of backrest and about 15 cm deep. These would be standard measures, although as we say, according to each person it is appropriate to adjust them. As for transport, do not forget to check it, as it is a key issue. And if not, think about what can be a walk of hundreds of meters to the beach carrying a heavy and bulky chair. Therefore,take the opportunity to do your homework and always bet on the lightest and most compact models you can, within the measurements you need as we have commented before. In general, the weight of the chair is around 3 kilos, being somewhat higher in the case of chairs with handle and the like. The heaviest models can reach 5 kilos, although there are also other foldable models weighing only 2 kilos. And if you want to have more comfort, you can choose the models with wheels that become a comfortable truck where you can take the fridge, towels or whatever you want. You choose what suits you best. And there you have it, 5 of the best beach chairs on the market reviewed allowing you to make an educated decision. Because everyone is different, the best beach chair for one person may not neccesarily be the best for another. So you just have to find the format that you like, load it and start enjoying your new chair. To relax on your beach or country days, having a comfortable and pleasant seat is essential. And that is why it is so important to know which is the best beach chair we can find, adjusted to our personal preferences and our needs. A task in which we want to help you find quality products, such as those included in our selection of the best beach chairs of 2018. This is a good starting point. Unless you want to leave your money in hammocks, bring your beach chair is the best way to ensure comfort and autonomy during your vacation. Some chairs that are no longer the heavy and bulky tackle before, but today are lightweight and quality products to take them wherever you want. Update your knowledge with our guide to buy the best beach chair according to what you need and discover the pleasure of resting comfortably on the sand.